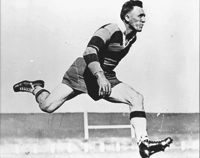 Eric Weissel, “Weissel the Wizard”, “Ec” to his friends, was a try-scoring, goal-kicking genius. In the Riverina of the 1920s and early 30s his performances helped develop the Maher Cup into a footballing phenomenon. Playing for small town clubs all his life, his performances were not commonly witnessed by Sydney commentators and experts. Although his brilliance may never have been properly appreciated outside Maher Cup country, many local witnesses consider him to be possibly the best five-eighth the world will ever see. He came from an extraordinary sporting family and below is an attempt at recording some of their history. Eric’s father, Edward Balthazar Weissel (1861-1934) , universally known as Ted, was a railway fettler – but also a sportsman, horseman and acrobat. He was a sprinter of such dominance in the railway picnic races that he was eventually barred from competing. He captained the Brawlin cricket team and possessed extraordinary horse skills. According to his obituary: “To see him performing on his pony was an interesting-treat. When it was cantering he could jump off and on from either side, and in jumping he would run along with the pony and jump the hurdle with it”. He also was a champion scratch-puller, a forgotten test of strength, similar in intent to arm wrestling. Mother, Ellen (nee Wignell) (1861-1942), was also a noted runner winning many races as a girl. She married aged 20 and instantly settled in to raise her growing family. She was one of 14 children, Ted one of 12. They must have liked large families, as they raised 11 children of their own, most of whom developed as fine athletes. Ted and Ellen were raised at Thurgoona, a then rural locality just a few miles from Albury. Following the completion of the Cootamundra to Gundagai rail line in 1886, the young couple and three children moved to the small village of Brawlin just south of Cootamundra. He was a per-way fettler on the new line. In 1897 he earned 7/6 per day. Later they managed the post office that operated at Brawlin siding. Ellen had eight more children here. Ted even built a pub for brother John Weissel to run. In 1906 the Weissel family moved into town, into Coota. The first-born, Catherine Weissel (1882-1971) was the only one not seemingly besotted by sport. Kate married John (Tiger) Fleming – a locomotive driver. In the 1920s he drove most of the special trains for the Maher Cup and did the engine tooting. Catherine lived in Cootamundra all her adult life. The eldest son, Edward P. Weissel (1884-1973), or E.P., managed “Illawong Station”, near Jugiong from about 1920. He played cricket and was president of the Jugiong club. As a young man he played rugby union until breaking a cartilage. His son, another Ted, was a teacher and outstanding cricketer. John Jephson Weissel (1886-1966), better known as Jack, played cricket for Muttama, Brawlin and Cootamundra. He was an champion wicket-keeper. He also rode a successful jumping horse, Rainbow at local shows, and had trotters. In the 1920s Jack settled into farming near Ungarie in the far northwest of Maher Cup country. He retired to Miranda in Sydney later in life. William H. Weissel (1889-1945), became a telephone line foreman for the GPO, living at Harden all his married life. Bill was a goal-kicker for Harden and played cricket. In 1921 he kicked the winning goal for the “hyphenates” to beat a Cootamundra rugby league side which included his 18 year old gold-kicking brother Eric. However his first love seemed to be music – being very active in bands in both Cootamundra and Harden. Alice Maud Weissel (1890-1976), known simply as Maud, was a nurse and tennis player. She married William Moyes in 1916 and divorced him in 1924. Mabel Linda Weissel (1892-1979). She ran at picnics and also played tennis. Mabel married Hector McDonald a train driver at Cootamundra. They later settled in Orange. Gladys Ruby Weissel (1894-1964) unfortunately never passed on her sporting DNA. Living at Cootamundra her whole life, she ran and high-jumped, played tennis, hockey and cricket. In cricket she played in Sydney and against an English team at Junee. But it was with horses where she was most brilliant, riding in the Cootamundra show ring over the jumps. Cecil Francis Weissel (1896-1969). Cec was considered by some to be the best runner of the family and possibly a faster and stronger footballer than Eric if only he had had the opportunity to “follow up that game”. He played cricket as a young man captaining the Cootamundra cricket team, while also playing football for Cootamundra and Murrurundi. In 1923 he won the £100 Tamworth Cup footrace. He moved north working as a railway telegraphist at Murrurundi, Werris creek and later in Newcastle. Ester George (1897-1982) was known simply as George. Like Cecil he became a railway telegraph operator, living at Nyngan as a youth and later at Temora, Harden, Temora again, Goulburn and Junee. At Temora he played good tennis and football. His son George (1924-2000) became a priest and was later chaplain at Mt St Joseph’s Home, Young. Eleanor (1900-? ), known as Ella. She married Charles Gadd, another railway telegraphist. They lived initially at Narrandera where both competed in footraces. They spent the rest of their lives up north at Grafton where Ella Gadd was a tennis player of note. And finally, more than 20 years after her first baby, Ellen Weissel gave birth to her final child – Eric Leslie (1903-1972). With all these older siblings being so active and talented is it any wonder he developed into perhaps the most magnificent of the magnificent Weissels? More about Ec in another article. This entry was posted in People and tagged Cootamundra, Eric Weissel, German-Australians. Bookmark the permalink.